The Droid Razr M is very well put together. The body, made chiefly of polished aluminum, is compact measuring 2.39 by 0.33 by 4.89 inches (width, depth, height) and refreshingly light at a mere 4.4 ounces. Further, the chassis is enveloped by Motorola’s patented Kevlar anti-scratch covering and a special additional coating that collectively make the Razr M both scratch and water resistant. The 4.3-inch screen is the preeminent design facet. It is a capacitive touchscreen display with a very slim all-round bezel employing the Super AMOLED technology - all protected by Gorilla Glass 2 for added sturdiness. The screen, which bears a fairly impressive 960 by 540-pixel resolution, offers sharp and clear images as also good viewing angles. Also, the screen houses a 0.3-megapixel front-facing camera for video calling. The rest of the Razr M neatly encompasses the camera, LED flash, and other controls. The smartphone currently ships in two colors – white and black. · The Razr M sports a dual-core Snapdragon S4 processor with a clock speed of 1.5 GHz. Throw in 1GB of RAM into the mix and you have a smartphone that is exceedingly fast, resilient, and adept at multitasking. · The high-capacity 2000 mAh Li Ion battery adds to Razr M’s power affording plenty of sustenance on a single charge. Note, however, that the battery cannot be removed. · The Razr M uses Android's 4.0.4 (Ice Cream Sandwich) operating system. This results in a friendly and quick user interface with easy to use menu controls. · The included keyboard deserves a mention – it has large, well-proportioned, and receptive keys that make typing a facile affair. The smartphone even embodies the handy "Swype" keyboard functionality that enables you to construct meaningful language just by swiping through the desired keys. 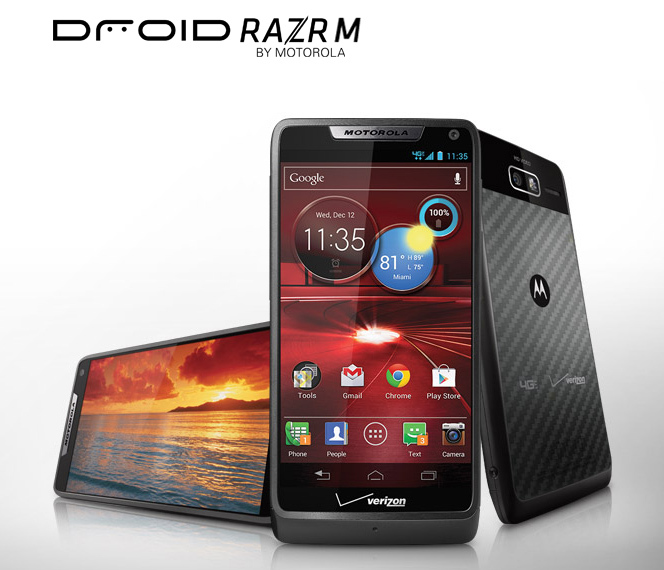 · The Razr M has a capable 8 megapixel rear camera that takes reasonably good photos. For versatility, the camera possesses numerous embedded options like inbuilt stabilization, autofocus, geo-tagging, scene controls, and customized filters. There is an LED flash too for low-light conditions. · The smartphone has an able camcorder that can record 1080-pixel videos at 30 frames per second. · A generous internal space of 8 GB that is expandable up to 32 GB via standard memory cards. The Motorola Droid Razr M, given all the above commendable features (minor quibbles aside), retails at a current price of just around $100. If you are in the market for a good, solid all-round smartphone, this gadget really is a nice deal. This is a guest post by Ann Phillip of globalx.net, a site that offers savings and current information on dish tv packages. The only real strike against this smartphone is its slightly underwhelming camera. If you want an excellent user experience at a reasonable price, the RAZR M is your best choice on Verizon Wireless.